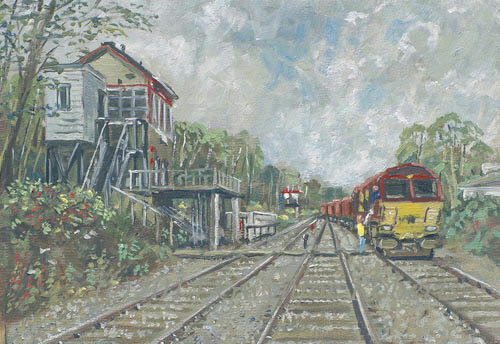 This small oil sketch (24cm wide) shows the locomotive driver handing back a token to the signalman at Ystrad Mynach signal box and is known as 'exchanging tokens'. The exchanging of token is necessary when a train journeys along a single line track to ensure no other train accesses the same line. On this occasion the locomotive is taking coal from The Coal Depot in Cwm-Bargoed to Aberthaw power station and this journey is along a single line track which passes alongside Ystrad Mynach station. Whilst I have seen 'exchanging tokens' I have painted this view with a little 'artists licence' since as we all know, I am not allowed to stand in this location on the tracks. But then, it doesn't take much to visualise this painting. Ystrad Mynach signal box has now closed and all the signaling is carried out in a central office in Cardiff. Lets hope something good becomes of the signal box. Click HERE. to see a similar painting showing 'exchanging tokens' at Crumlin Viaduct.